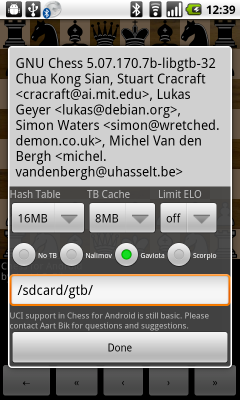 User PJ+ at the OpenChess forum implemented a nifty client utility that converts Chess for Android to a client for a remote chess server. To make this work (assuming you already have a remote chess server running at some hostname and port), simply do the following steps. Jan Brouwer ported his UCI engine Rotor to Android. Below the results of a few matches against other engines on a Nexus One (1GHz Snapdragon), one second-per-move, 16MB hash, and Nalimov/Gaviota/Scorpio endgame tablebases on SD card. I don't have a tablet myself yet, but Roel from Belgium kindly emailed me this picture of Chess for Android running on a 7 inch tablet. As you can see, he was running an engine-engine match between UCI engines at the time. Thanks Roel! Chess for AndroidCheckers for AndroidReversi for AndroidAfter the download completes, simply click the apk to start the install (make sure to check "unknown sources" under settings=>applications). I ran an engine-engine match between Michel Van den Bergh's two latest GNUChess engines in Chess for Android, playing 100 games (50 fixed book opening lines from both sides) on a Nexus One (1GHz Snapdragon), one second-per-move, Hash 16MB, TB cache 8MB, complete 3- and 4-piece Gaviota endgame tablebases on SD card (only 5.07.170.7b supports Gaviota). 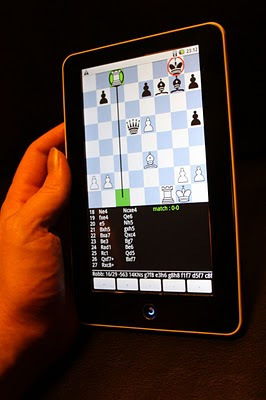 Several folks who use Chess for Android to play against another human have requested a feature to auto rotate pieces towards the side to move, so that they can use the phone or tablet as a chess board without constantly having to pass the device around. I have added this feature and also made cautious steps towards some animation in the application. The following clip shows the results. Expect this feature in an update soon. Comments welcome.